It is extremely meaningful to be here right now. 5 years ago pretty much to the day, my brothers flew with my fathers body to Israel for a 2nd funeral and burial. There was a man in the back of the Israel funeral that my brothers did not know. It was one of my best friends husbands (also my friend), paying respects to my father when I was not even there. There are simply no words for what that means to me but it pretty much sums up who they are. 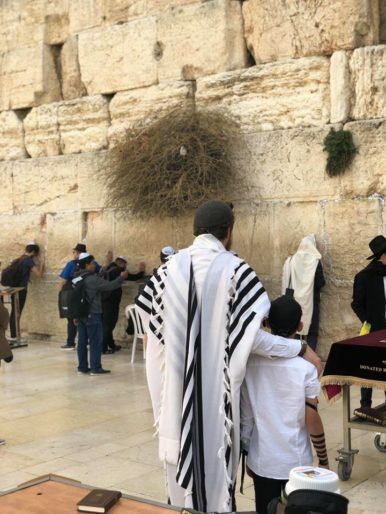 Fast forward 5 years later and on the morning of my fathers yartzeit (memorial) we are together at the Kotel celebrating an almost Bar Mitzvah boy putting on his Tefillin for the first time. Mazal Tov!! May we share in many, MANY more smachot (happy occasions) together. PREVIOUS POST Previous post: 5 years.